Smoking meat started out as a food preservation measure. It was popular before electricity when the main way to stretch the safety window for meat was to cook it or salt it. Smoking worked better than both, because salted meat often had to be rinsed to get rid of excess salt, and smoking made the meat last longer than actual cooking. Of course, smoking is a form of partial cooking. You can eat smoked meat as is or re-cook it some other way. It takes several hours to do it right, and the trick is to smoke your meat over embers rather than live flames. Fruitwood is great for smoking because it gives meat added colour and flavour. Applewood and Peachwood give a sweet tang, while Mesquite is sharper. If you’re going to smoke a large batch of meat in a single go and you need quality but comparatively cheap firewood, Sydney is a good bet. Here at Ample Firewood, we stock a large variety of fruitwoods, from charcoal to chunks, with variations like apple, peach, pear, plum, pecan, grape, apricot, and nectarine. We even have oak chunks soaked in red wine for that extra kick. Smoked meat has a moist texture and rich flavour achieved by slow cooking. You can smoke your meat on a barbeque spit hung high over an open hearth, or you can use wood powered grills. The meat shouldn’t come in direct contact with fire, so let the fuel cool into glowing coals before you lay out the meat. Some barbeque experts suggest using small wood chips soaked in water to control heat levels. The chips should be wrapped in aluminium foil. Poke holes in the foil to let the wood ‘breathe’ then light the flame beneath the foil so that the wood chips are heated indirectly. 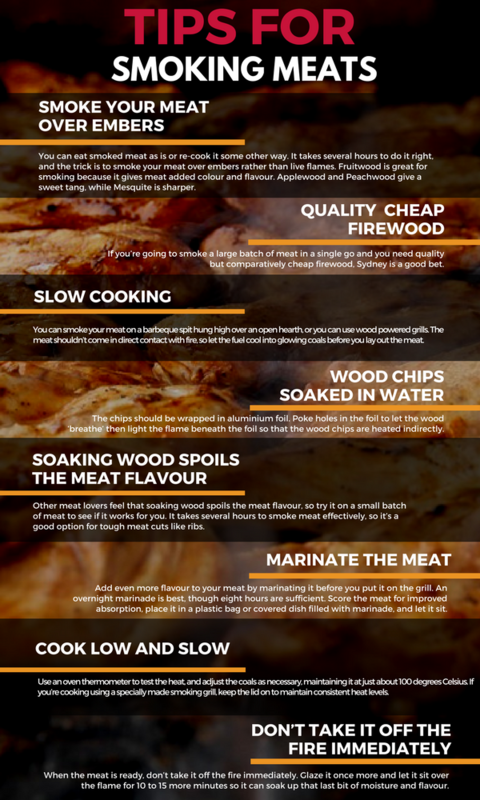 Other meat lovers feel that soaking wood spoils the meat flavour, so try it on a small batch of meat to see if it works for you. It takes several hours to smoke meat effectively, so it’s a good option for tough meat cuts like ribs. Poultry and oily fish like salmon and trout can be smoked as well. It enriches their flavour and gives a tantalising tone you don’t get by frying. Add even more flavour to your meat by marinating it before you put it on the grill. An overnight marinade is best, though eight hours are sufficient. Score the meat for improved absorption, place it in a plastic bag or covered dish filled with marinade, and let it sit. Alternatively, rub some salt and spices on the meat a few minutes before placing it over your embers. The ideal cooking style for smoked meat is low and slow. Use an oven thermometer to test the heat, and adjust the coals as necessary, maintaining it at just about 100 degrees Celsius. If you’re cooking using a specially made smoking grill, keep the lid on to maintain consistent heat levels. For open roasting, you can taste your meat occasionally to see if it’s ready. When the meat is ready, don’t take it off the fire immediately. Glaze it once more and let it sit over the flame for 10 to 15 more minutes so it can soak up that last bit of moisture and flavour. Since smoking takes a while, be sure to order a large enough firewood bag before you begin. We have a delivery service so that you can talk to us about volumes and requirements. To order the right bag of fruitwood for your smoking adventures, call us on 1800 677 918.